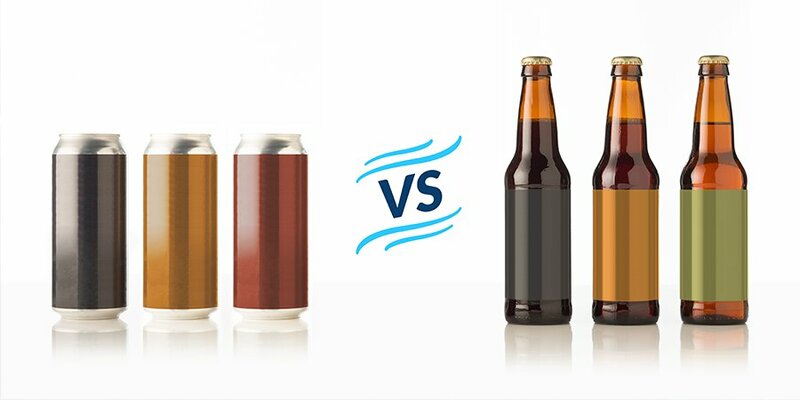 When it comes to deciding how to package your craft beer, the choice between cans vs. bottles is just the beginning. In the past, canned beers were often seen as inferior, and almost all craft brewers opted for bottles. Today, however, there is an increasing interest in canning craft beers as a less expensive and more consumer-friendly option. Here is a breakdown of the great cans vs. bottles debate. Bottles are traditional, and according to industry experts, consumers are drawn to bottles more than cans. In many cases, the bottle gives the beer a distinct appearance of higher quality. Many people report that when two identical beers are side by side in a can and a bottle, more people will purchase the bottled option. Bottles do offer a bit more flexibility for brewers as they are easier to label or change labels on if there is a mistake. The biggest downside to glass bottles is that many parks and other facilities have recently banned bottles on their properties, and glass is very heavy and difficult to ship. Overall, the bottle is more about the illusion of a higher class product. The technology for canning is much different and requires a separate investment in equipment. However, many craft brewers have found advantages in canning due to the lighter materials that are easier to ship and require significantly less storage space. Also, the cost of entry-level canning has come down significantly over the last few years. Cans keep out sunlight and are better sealed to prevent oxidation. Some of the latest industry favorites in the craft beer category are now available only in cans as companies see the savings of cheaper materials. No matter what type of container you choose for your craft beer, your cans vs. bottles decision must include a plan for getting your name out there. There are both in-line and rotary labeling options available for low to high production running of labeling applications. The labeling equipment you ultimately purchase will be based on the type of label you are using. For bottles, you will have a choice between a variety of paper and ink labels or screen printed images directly on the bottle. Check out 8 easy steps to choose a label. On the other hand, cans can either be directly printed on, use shrink-wrap technology, or the most popular printing right now is the pressure sensitive labeling. The choice between cans and bottles is not an easy one to make. There are reasons that both container formats are still successful today. Many small craft brewers find it easier to work with bottles on a small scale because they leave more room for experimentation and error. On the flip side, once you are ready to ramp up production, cans can be more cost effective and easier for your consumers to purchase and transport in the real world. ©2018 Pack Leader USA, LLC. Website designed in Kansas City by Tank New Media.